Drinking water is essential for a healthy body and a glowing complexion. But I get it, when you’re suppose to drink eight 8-ounce glasses per day, plain old H2O can get boring. Adding certain ingredients to your water not only gives it a refreshing and unique taste, but it works to cleanse and detox your system too. Detox water comes in many forms, whether you want to clear your skin, lose weight, flatten your tummy, or just up your hydration game. There are so many different water detox recipes to choose from that are one hundred times healthier than reaching for juice or soda pop. Your daily water regime is about to get a delicious upgrade. 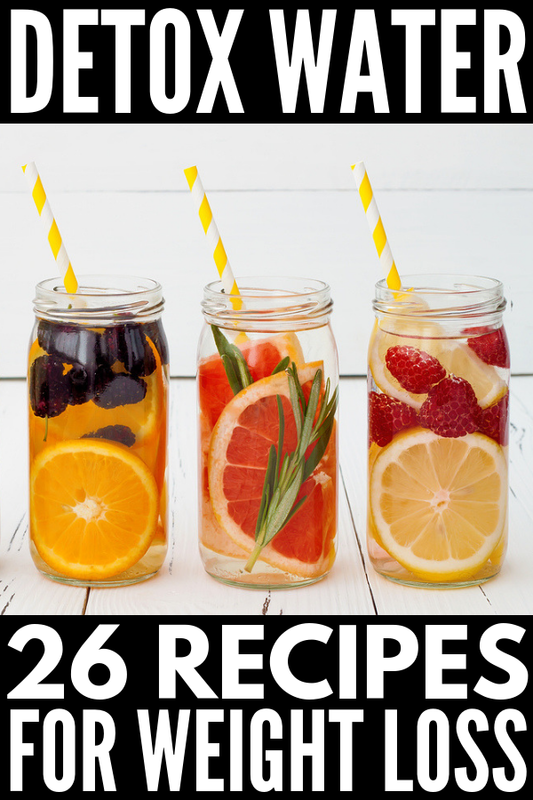 Check out 26 of our favorite water detox recipes below and drink your way to gorgeous skin and your flattest tummy! You can make most of these by simply adding the ingredients right to a pitcher or water bottle, but if you plan on incorporating water detox recipes into your daily routine, there are heaps of inexpensive infuser pitchers and infuser water bottles you can purchase to take your hydration routine to the next level. When we hear the word ‘detox’, many of us automatically go to the negative. Words like ‘deprivation’, ‘withdrawal’, and ‘on the wagon’ come to mind as we envision a life devoid of any kind of joy and fulfillment, and while most detox diets are pretty restrictive in nature, anyone can enjoy the health benefits of water detox recipes without feeling deprived. As the name implies, detox water is aimed at detoxifying our bodies. Also known as infused water, water detox recipes are steeped with the flavors of various fruit, vegetable, and/or herbs, and since they are infused rather than blended or juiced, you’re able to reap the benefits (and flavor) without packing additional calories into your diet. How Does Detox Water Help with Weight Loss? While water detox recipes on their own can’t make up for poor lifestyle choices, they can certainly help you reach your weight loss goals, decrease bloating, and clear your complexion when combined with healthy food choices and a good workout regime! Citrus fruits like lemons and grapefruits rid toxins from your body and boost your metabolism, while berries are super high in anti-oxidants, and mint promotes digestion. Another popular ingredient in water detox recipes is apple cider vinegar. It promotes weight loss by helping with digestion, and detoxes your gut for healthier looking skin. And then there are oranges and tangerines, which are packed with vitamin C to stimulate your liver and promote a full body cleanse. What Are the Other Health Benefits of Detox Water? Water detox recipes can also help reduce inflammation in the body while also removing toxins from your organs. What’s the Best Detox Water for Weight Loss? When it comes to finding the BEST water detox recipe for weight loss, most online sources suggest the greatest benefits come from drinking a glass of warm lemon water first thing in the morning to help flush your digestive system while simultaneously hydrating your body. Consider adding a few sprigs of mint and/or cucumber slices to your lemon water if you find it too bitter on its own. If you’re not a fan of lemon water and/or want more water detox recipe ideas to help you in your weight loss journey, we’ve rounded up 12 more recipes below to detox, de-bloat, and flush fat from your system! If you’re looking to shed a few pounds, this detox water is perfect for you! It has just 7 calories per 8 oz glass, zero sugar and lots of vitamins! Cucumbers help your body release water and grapefruits are rich in enzymes that burn fat. It will cleanse your system and boost your metabolism! Infused water really does conjure up thoughts of relaxing spa days, doesn’t it? With lots of high antioxidant berries and lemons to detox and reduce inflammation, this detox water works hard to banish fat. Slim down with this fat burning mixture. Apple cider vinegar helps with digestion and speeds up your metabolism, promoting weight loss. Cinnamon also boosts you metabolism and curbs food cravings so you won’t be snacking throughout the day. Bloating is the worst. Conquer it with this detox water recipe and de-puff. It will cleanse your system, hydrate you and help with water retention. It will also give you a nice burst of energy! Rid your body of excess water and bloating with this detox recipe! The fresh mix of lime and cucumber will have you coming back for more and the apple cider vinegar will rev your metabolism, keeping you slim! This tasty combination of grapefruit, cucumber, tangerine and peppermint leaves is perfect to combat bloating! Grapefruit blasts fat, while the other ingredients rid your body of toxins. And peppermint makes it super refreshing! This detox water recipe includes strawberries, which are packed with fiber to boost your digestion, and basil, which helps with fluid retention as well as curbing your appetite. Cucumbers also help with fluid retention, and the trio tastes absolutely divine together! High in anti-oxidants, raspberries are the perfect addition to this lemon detox water. Lemons contain so many key nutrients that work together to reduce inflammation and lemon essential oil is great for detoxification. With regular exercise, this recipe will have your belly looking flat in no time! This recipe is so simple, but you’ll reap plenty of flat tummy benefits! Lemon and ginger together will boost your metabolism, strengthen your immune system, flush out toxins and promote appetite control. What a perfect match! Did you know water could get this fancy? I sure didn’t. Lemons are a great way to detox your body, plus they help boost your metabolism. Add in some extra ingredients like lavender and honey, and you’ve got some vitamins, minerals, and a sweet taste that’s almost too good to be true. Ginger is one of the most powerful superfoods on the planet! Seriously, it is SO good for you, from its anti-inflammatory properties to its ability to relieve digestive problems. If you’re ever feeling sick or nauseous, ginger should be your go-to! Add lime to the mix and you’ve got a super digestive water mix! Drink this one after your meals to combat that bloated feeling. A little bit of mint, a little bit of lime, and a little bit of green tea, this infused water recipe will flush and detox your body. Green tea is great for weight loss, while lime relieves aches and pains, and mint adds a nice sweetness to the mix. Drink it on any hot day to cool you down. If you’re looking for water detox recipes designed specifically to help clear your skin, these ideas are equal parts delicious and effective. Cucumber boosts hydration, and just a few slices add so much flavour to H2O! Mint aids with digestion, which helps your skin glow from the inside out, and lemon is a super detoxer! These three ingredients will not only help clear your skin, but taste scrumptious while doing so. Lemons are packed with vitamin C and also stimulate the liver, enriching your body’s detox capabilities. Apple cider vinegar is high in enzymes, and along with aloe promotes a healthier gut, leading to a clearer complexion. Honey is great for anti-bacterial purposes, but since it’s rich in sugar, be mindful of how much you use. This combo has so many goodies for your skin. Along with lemons and cucumber slices, it also has ginger, which is amazing for digestion and circulation; peppermint to suppress your appetite; and grapefruit and lime, which detox the kidneys! Whether you struggle with breakouts during your period, or have more severe acne year-round, these water detox recipes are great natural remedies for a clearer complexion. Blueberries are one of the highest sources of anti-oxidants, which work wonders for acne-prone skin. Plus, mandarin oranges are packed with vitamin C – another powerful anti-oxidant that will help clear your complexion. How refreshing does this one sound! If you have acne-prone skin, it’s important to stay hydrated as well as flush your system. Watermelon helps the body flush out toxins and cucumber will keep you ultra-hydrated. Plus, the two of them together taste absolutely amazing! Chia seeds are a powerful superfood packed full of antioxidants and nutrients. They reduce inflammation and work to prevent breakouts, and mixed with your favourite fruits, provide a detox water you’ll love to drink day after day. Drinking water is so important for your health, skin and body, and getting the recommended amount (8 8-ounce glasses) is hard for a lot of us. Try these infused water recipes using a fruit infuser bottle (I really love my Hydracy Fruit Infuser Water Bottle) before and after your workouts, on long weekend outings, at the beach, and bring them with you to keep at your desk to ensure you’re drinking enough water throughout the day! For me, this infused water recipe has it all. Cucumber water is crazy refreshing, and with the addition of watermelon, it’s a match made in heaven. You could use either of these ingredients in water alone and it would be thirst-quenching, but why not add them together? Serve this blend when you have guests over and drink it after your workouts to hydrate! Anyone a fan of Starbucks’ very berry refresher? It’s one of my favourite drinks, and this infused water recipe mimics it, without the tea, and without the high price tag! Simply blend lemons, and a frozen berry medley containing strawberries, blackberries, blueberries, and raspberries, and you have a delicious, refreshing drink! There are better (and yummier) ways to get your daily vitamin fix than popping pills each morning. This water blend contains loads of vitamins, from grapefruit, which is high in vitamins A and C, to cucumber, which is packed with vitamins B5 and K, and so much more. This water recipe is packed with fruits that taste delicious and do your body good, so do yourself a favour and sip on it daily! What could be better than sitting out on your porch with some refreshing strawberry mango water? Both fruits offer a subtle, sweet taste that will have you coming back for more. Plus, there are tons of health benefits that come from adding strawberries and mangoes to water, including helping your complexion and lowering cholesterol. I’ve already sang ginger’s praises, but adding it to any water medley is sure to do you good. Pineapple is packed with nutrients, vitamins, and minerals including vitamin C, B6 and folate. And oranges are an excellent source of vitamin C, potassium, and more. The three ingredients together make for a delicious flavored water recipe that will see you through any summer event! Infusing your water with tons of fruit is a great way to get lots of health benefits with a tasty drink. For this one, add in orange slices, strawberries, and mint leaves for a flavorful treat that tastes nothing like plain ol’ water. Yet, you’ll reap all the benefits of getting your water fix – it’s a win, win! Kiwis are such tasty fruits, I love eating them on their own or atop smoothie bowls in the summer. And here’s another great way to get your kiwi fix! Add in blackberries, which have one of the highest antioxidant content of any fruit, and you’ve got a healthy and thirst-quenching water mix for the hottest summer days! This combination is heavenly. You’ll have to scroll down a bit on the page to see it, but it was too good not to add to this list. Just like a lovely tea, let the delicious ingredients steep, and strain them when they’re ready. The result will be an instant favorite! Whether you’re looking for water detox recipes to improve your digestion and reduce bloating and constipation, or need natural acne-fighting remedies for a clearer complexion, these water detox recipes taste amazing and will make you feel healthier and happier from inside out! If you found this collection of water detox recipes helpful, please share this post on Pinterest! And if you’re looking for more health-related tips and tricks, please follow our Health board where we share all kinds of helpful ideas we find each day!